Well done, Andrew Murtagh. How much is known about the batting genius, Barry Richards? How many books have been written about Barry Richards? I can think of Barry’s autobiography, The Barry Richards Story, published in the 1970s but nothing much springs to mind and it doesn’t seem right that, with the wealth of cricket books around, not more has been devoted to this wonderfully talented South African opener who, but for his country’s expulsion in 1970, would surely have been one of the leading world cricketers. And doubtless had more written about him. Barry’s name, rightly, is still out there in cricketing circles but one feels that cricket connoisseurs deserve to learn more about him and this is why we should be grateful to Andrew Murtagh. The Richards – Barry not Viv, of course – career consisted of four Tests, 508 runs, two centuries and an average of 72.57 yet overall, in First-Class cricket, he scored eighty centuries but always yearned for the biggest stage to display his considerable talents. It is suggested that he maybe should have scored a century of centuries but, at times, was dismissed when he could have made more. Many Hampshire and Natal supporters will have been grateful for his presence but it cannot be felt that such a talent was not seen more for South Africa. He may have felt that further opportunities would come after his considerable success in his debut series and who knows how good the South African side which demolished Australia in 1970 might have become? Pure conjecture, of course, but as the ban continued, so spectators were deprived of seeing many remarkable players. 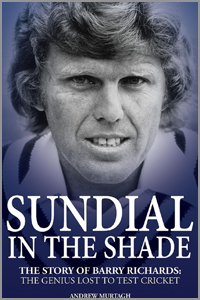 Sundial in the Shade takes us through Barry’s career including the 1970 South Africa against Australia Test series, his time at Hampshire, Natal, Kerry Packer’s World Series Cricket and his time after cricket. Through conversations with his subject and other players via the help of Skype, Andrew Murtagh gives the reader an idea of what made Barry Richards such a special talent. Cricket has benefited through having Barry Richards on the domestic scene and it is understandable that Barry himself felt frustrated at times. Not everything has been kind to him but Murtagh suggests that he has now reached an uneasy truce with his sense of unfulfilment but many of us will be grateful for the memories. Barry Richards, though, still is a very recognisable face. I remember cursing myself that, on a departing plane from India, Barry Richards boarded, walked towards his seat and, for a while, I thought that he might occupy the seat next to me. He didn’t and was in the seat in front. I feel that I was right not to pester but felt frustrated. Lady luck, though, was on my side a few months later when Bill Frindall invited me to score at the SunLife of Canada Under 16s Finals Day at Basingstoke – a place Barry complains about still having a splinter from the wooden floor – and the main guest, amongst a host of celebrated cricketers, was Barry Richards. As the commentator, I was his scorer and, for around an hour and a half, I watched this highly professional and articulate man and cricketer, perform. Like Andrew Murtagh, I feel supremely lucky and welcome, as I hope many other people will, the insight which Sundial in the Shade gives into one of South Africa’s legendary cricketers.